Tired of Cydia Ads Opening App Store Every Other Minute? Here is a Workaround! Yes, we too are annoyed! One of the worst thing happening at Cydia is those ads that seem to wake up whenever you open a package and they automatically open the App Store. It is not the user’s fault or a “wrong tap” case. The Cydia ads are obtrusive at best and their only desire is to somehow open the App Store redirecting you to that promoted app. While we are quite used to seeing ads almost everywhere in our online world, getting ads perform a task that disrupt our work flow and destroy the user experience, is beyond just annoyance. This ad auto-redirecting issue although doesn’t occur everywhere on Cydia, but affects only some of the repos. Whatever the reason, here is how to handle this issue and get rid of those pesky little ads opening the App Store. 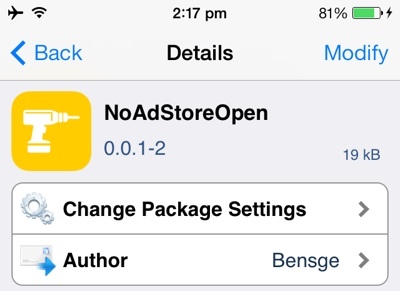 iOS 7 Cydia jailbreak tweak titled NoAdStoreOpen prevents these Cydia ads from automatically opening the App Store inside of Cydia. Developed by the German Bensge, you can get NoAdStoreOpen from Cydia for free. Install the NoAdStoreOpen iOS 7 jailbreak tweak on your iPhone or iPad and prevent ads from force directing you to the App Store download page. Let us now if NoAdStoreOpen iOS 7 jailbreak tweak helped you in preventing ads from auto-redirecting to the App Store.